For some reason, I'm rather excited about the idea of another Dan Brown adaptation courtesy of Ron Howard and Tom Hanks. By the time this latest film premieres it will have been over a decade since The Da Vinci Code hit theaters and while I found that film incredibly challenging to get through in its long stretches of being little more than boring it felt like an event of sorts and that it ended up making $217 million domestically and $758 million globally there is no surprise it spawned more adaptations of Brown's work. Though 2009's Angels & Demons didn't do as much business it still fared well and is easily the more entertaining of the two films. With many notes acquired I'd be surprised if Inferno doesn't turn out to be a fun, unfiltered mystery/thriller that plays into all our favorite guilty pleasures that seem to make up the easily digestible narratives of Brown's work. That said, I still haven't read any of Brown's novels and don't plan on changing that soon so I have no idea how good or potentially fun this adaptation stands the chance of being, but I enjoy conspiracies and Tom Hanks enough to be excited for this thing. 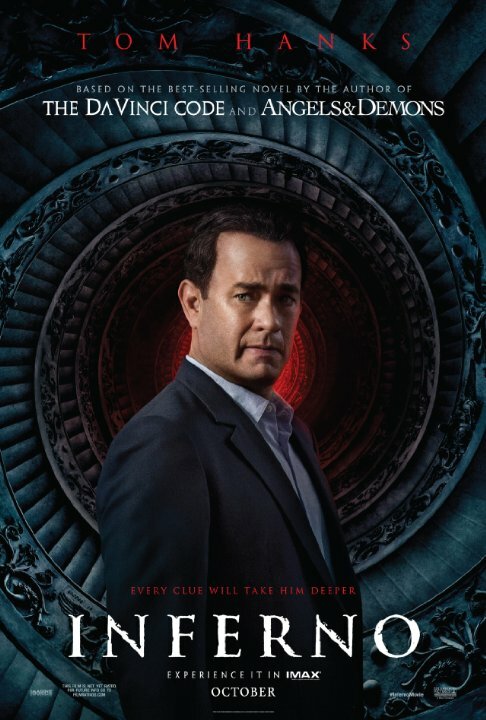 David Koepp returns after adapting Brown's Angels & Demons to do the same here and replacing the obligatory female sidekick previously played by the likes of Audrey Tautou and Ayelet Zurer is Felecity Jones who, in this story, helps Hanks' Robert Langdon race against the clock to foil a deadly global plot. The catch is, the beginning of the film finds Langdon waking up in a European hospital with amnesia. How will this play into the plot? Who knows. Hopefully it simply serves to make the mystery as intriguing as possible as that was the biggest downfall with the series originator. Of course, the biggest mystery will be if there is still an audience for this series seven years after the last film and three years after the book was published. We shall find out when Inferno, also starring Ben Foster, Omar Sy, and Irrfan Khan, opens on October 28th, 2016. Synopsis: Academy Award® winner Ron Howard returns to direct the latest bestseller in Dan Brown’s (Da Vinci Code) billion-dollar Robert Langdon series, Inferno, which finds the famous symbologist (again played by Tom Hanks) on a trail of clues tied to the great Dante himself. When Langdon wakes up in an Italian hospital with amnesia, he teams up with Sienna Brooks (Felicity Jones), a doctor he hopes will help him recover his memories. Together, they race across Europe and against the clock to foil a deadly global plot.